Named after the wild cranberries that used to grow along Brush Creek when early settlers arrived in western Pennsylvania in the late 1700s, Cranberry became one of Butler County’s 13 townships in 1804. Currently one of the fastest-growing communities in western Pennsylvania, those of us who grew up in the North Hills before 1980 have witnessed the township’s amazing transformation from a placid stretch of farmland between Wexford and Zelienople to a vibrant community with a healthy economy. According to the township website, Cranberry is home to such major operators as McKesson, Alcoa and Mine Safety Appliance, as well as a growing number of leading-edge startups. Manufacturing, finance, retail and hospitality businesses call it home, as well. A low-tax municipality, Cranberry takes an entrepreneurial approach to creating public assets. “Partnerships with private companies, nonprofit organizations and other units of government have helped the township create cultural and recreational resources, which are among the best in the region,” said Mazzoni, adding that the township also boasts a top-notch school district in Seneca Valley. Cranberry also has some of western Pennsylvania’s newest and most attractive housing, ranging from large-lot estates and single-family homes to townhouses, apartments, condominiums and traditional neighborhood developments. “Most of Cranberry’s 30,000-plus residents chose to relocate here from other parts of the region, and many came from other parts of the world,” said Mazzoni, adding that volunteerism and a sense of real engagement are the defining characteristics of the township. A family-friendly community, Cranberry takes recreation seriously. “We have three major public parks, plus a waterpark, a skate park and a dog park as well as Cranberry Highlands, which Golf Digest selected as Pennsylvania’s best municipal golf course in 2009,” noted Mazzoni. Throughout the summer, the township hosts free concerts and a farmers’ market. Cranberry’s annual Community Days, which will take place this year from July 8-11, features three days of concerts, plays, entertainment, and more than 200 vendor booths. The event kicks off with a golf outing Thursday afternoon and ends with a spectacular fireworks display on Saturday night. It’s all designed to raise awareness of the area’s nonprofit and civic groups, encourage volunteerism and raise a significant amount of money for a worthy cause. Proceeds generated during Community Days seed the next year’s community project. “Last year, it was a volunteer firefighter initiative to make people aware that there are a declining amount of volunteer firefighters,” said Mazzoni. “We got two new recruiting trailers, and we set up scholarships at Butler County Community College where individuals can get firefighter certification and study any subject.” Approximately $400,000 was raised for the effort. This year’s proceeds will go toward resurfacing Miracle League Field in Grant Park, which enables special-needs children to play baseball. 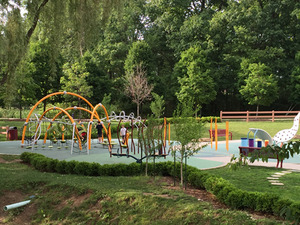 Built nine years ago, the playground serves 80 communities. “The synthetic field needs to be resurfaced, and we’re building a playgroup around it in Graham Park,” said Mazzoni, noting that they need to raise $600,000 for the project. Karen Newpol is the race director of the Community Chase 5K, which will take place on July 11 at 8:30 a.m. “The race is going into its fifth year, and it gets more popular every year,” said Newpol, adding that the race’s unique feature is an off-road section through Community Park, which entices runners from all over Pittsburgh. Thursday evening concerts on the lawn at the Community Park Rotary Amphitheater, 111 Ernie Mashuda Dr., Cranberry Township, PA 16066. Bring your own lawn chairs, blankets and refreshments. Food will also be available for sale from the Cranberry Township Noon Rotary. Jul. 16: Blackhorse. The sole focus of this five-piece band is on presenting the overlooked classics of country music made popular by such legends of the genre as Johnny Cash, Merle Haggard, Buck Owens, George Jones and Hank Williams, Sr. 7 p.m.
Jul. 23: Keystone Musical Theater. Led by theatre veterans Chris and Alison Rose Saunders, KMS members will present a revue of music taken from popular Broadway shows. 8 p.m.
Jul. 30: Network. The quintet that makes up Network concentrates on familiar songs, encouraging audiences to sing along with such classics as Ain’t No Sunshine, Brown Eyed Girl, Beast of Burden, Fly Like an Eagle, and Some Kind of Wonderful. 7 p.m.
Aug. 6: NOMaD. The six members of NOMaD, whose name comes from North of Mason-Dixon, are known for their hard-rocking country style which has been on display as an opening act for national shows as well as on its self-titled CD. 7 p.m.
Aug. 13: Elvis Lives. Elvis Lives, A Tribute to the King, features Randy Galioto in the title role of a unique act designed to capture the essence of a live 1970s show. It includes a variety of music from Elvis’ early days through his performances in Las Vegas. 7 p.m.